The thing about the internet these days is that the old rules supposedly no longer apply. I for one don’t buy that completely, and am not going to ditch the fundamentals and start doing daft things like passing off someone else’s work as my own. What it does allow, however, is the scope to put together research extra quick, and moreover to use things like search engines to derive quantitative statistical results. Keith Briggs’ previously-mentioned research on place-names in England and elsewhere of the “seven wells” type treads where few other onomastic investigations have gone before or since (at least not to anything like the same depth and breadth) by considering the underlying meanings of such appellations and their origin. At first I thought that having a much smaller population of names on my hands meant there would be no scope for attempting an equivalent exercise for “seven ditches”. But one quiet afternoon at work back in the summer I decided to see what I could find through some simple Google searches. How wrong my initial preconceptions were proven to be. Around the time I was first assembling the data I read a slightly paranoid-toned article explaining how the internet is being “personalised” to suit the search and browsing history of users. What follows may hence be affected by Google’s logarithms and data analysis software; when I conducted a basic search for the term seven ditches on http://www.google.com brought up 2.01 million hits back in the summer, but when I repeated it just now the number is up to 3.3 million (it is interesting that the equivalent numbers for www.google.co.uk are 1.95 million and a whopping 4.5 million). I will persevere nonetheless as I think most of my results would be the same with or without the unwarranted input of Those Who Run The Internet. Several points need to be made about the above. First is that the above contain all manner of combinations of the two words. To take the example of “seven ditches”, four of the first ten results are the Wikipedia page on the Hog’s Back and my three previous posts on the “seven ditches”, and it may well be the case that my search history is skewing the results thus. Of the other six, five derive from Australian news articles and message board posts: most dramatically an aircraft making an emergency landing in Darwin Harbour, but also more mundane fare about the dropping of Aussie Rules football coverage and a presenting duo from a long-running tv show (is to ditch a particularly Australian verb?). There are also the numerous instances of the phrase being used in contexts in which seven represents the number of ditches that are the subject of what is being written about, but has no particular significance and essentially is incidental to it. It is not all that surprising how some are of an archaeological nature, although most are of completely unrelated derivation. I repeated the above search using the word “dykes” instead of “ditches”, as per the main alternative translation of Old English dic found in place-name dictionaries and so forth. This produced a smaller number of results, dominated by geological papers in which the number of dykes is coincidental again, and the inventively-titled lesbian re-imaginings ‘Six Lays, Seven Dykes’ and ‘Snow White and the Seven Dykes’. Somewhat surprisingly, not one of the hits for the search term “seven dykes” was of equal historical significance to those for “seven ditches” presented below. Before considering those results, the two sets of searches yielded a few individual results for some of the other numbers that are worthy of note. A trig point in South Lanarkshire is known as Five Dykes on account of it standing at the place ‘where five field boundary walls meet’ – unfortunately no information is given about the approximate age of these walls. There is another Five Dykes near Hexham in Northumberland. An Irish legend recorded by Gerald of Wales (possibly in his Topographica Hibernica of c1188) concerns an island divided into good and evil halves, with those seeking atonement for their sins spending a night lying in nine ditches ‘tormented in a thousand different ways’ (paragraph 12). This bears more than a passing resemblance to the ‘consecrated place with nine ditches’ named in the Videvdat, one of the sacred texts of Zoroastrianism, as the place for the conduct of the act of purification known as the maya. It is such affinities across continents and religions that I hope to demonstrate are even more of a feature of “seven ditches”. Though it may seem a little perverse, it is best to begin far away from the British Isles, for there are a number of interesting examples to cite from the Indian subcontinent, China and south-east Asia. According to Vedic mythology, ‘the rolling wheels of Maharaja Priyavrata’s chariot created seven ditches’; in these seven oceans formed, with seven islands in between. This illustrates an important point about many of the examples above and below, namely that “ditch” is but one of a number of possible translations, meaning it is important that too much weight is not attributed to them without first considering their linguistic and cultural background. In the story of the Panch-Phul Ranee (“Five-Flower Queen”), the heroine is a beautiful princess who lives in a house protected by ‘seven ditches and seven hedges made of spears’; it is recounted in full in the Freres’ Old Deccan Days (via Google Books, pages 146-50) as well as on Wikisource. 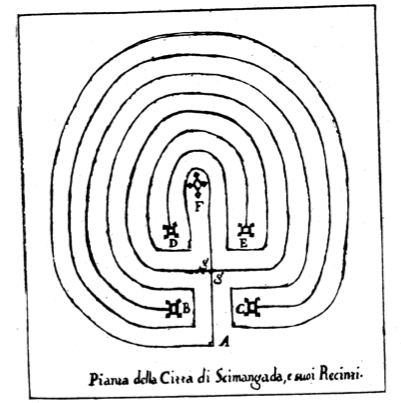 In his 2003 study ‘Shamanistic Echoes in the Ritual Ordeals of Devotional Hinduism’, Francesco Brighenti notes the continued practice of a firewalking rite in the Indian state of Orissa or Odisha in seven ditches ‘dug outside the premises of the shrine where the ordeal is to be carried out’; this description, and a later reference to ‘penitents’, invite analogies with the above-mentioned rituals associated with “nine ditches”. David Gordon White, in his 1996 study The Alchemical Body: Siddha Traditions in Medieval India (page 59), refers to another apparently current cobra-catching rite conducted by the Jogis of Sind province, Pakistan. They create seven dung-hills adjacent to seven water-filled ditches in which seven men then lie and lure the cobra with music. It is maybe worth noting how in this rite it is the dung-hills rather than the ditches that are set alight. According to the Book of Isaiah 11:15, God created the seven streams or channels of the Euphrates to allow it to be crossed on foot. Nineteenth-century Biblical scholar Albert Barnes noted that this may derive from the draining of the same river by Cyrus the Great (600×570 – 530 BC), by means of seven ditches in order to capture the city of Babylon. The theme in Islam of “The Pit of Fire” is most often traced back to the story of the last Himyarite king of Yemen, Zu-Nuwas. He is said to have commanded that a ditch be dug and filled with firewood; when lit men were thrown into the fire and killed. Although the main story refers to a single ditch, certain ‘commentators’ have suggested there may have been seven ditches. It is almost certainly of relevance that Zu-Nuwas is said to have been Jewish. On page 8 of his Narrative of travels in Europe, Asia and Africa, Evliya Efendi, a seventeenth-century Turkish writer explained the origins of ruined fortifications on the western outskirts of modern-day Istanbul as the work of a powerful king named Vezendun. He had ordered the rebuilding of the defences of the city of Makedun, specifically in the form of ‘seven long walls, and…seven ditches a hundred cubits wide’ in order to encompass the towns of Silviri and Terkos. In spite of Efendi’s claim that stretches of these defences reportedly could still be seen in his time, their purported original extent seems implausible given the two towns lay no less than nine hours journey-time apart. The eponymous setting for Sir Walter Scott’s poem The Castle of the Seven Shields is said to have had seven towers and was accessed by seven gates across seven ditches (lines 31-32). It is possible Scott had ancient descriptions of the city of Alexandria in mind when writing these lines. In Dutch there is a saying “Don’t walk in seven ditches at the same time”, which means to avoid getting into trouble. The low-lying nature of the region in which Dutch is spoken recommends that these ditches would more likely than not be filled with water – if they contained anything at all. Finally, there is a fortification named Wallburg Sieben Gräben, i.e. “Seven Ditches hillfort”, above the River Lenne at Hohenlimburg in North Rhine-Westphalia, Germany. Whether this name does indeed derive from the defences, or from an earlier ditch or ditches on the site, is unknown, but could suggest that the name, like “seven wells”, is a compound also found outside of England. From all of the above a number of recurrent themes emerge. 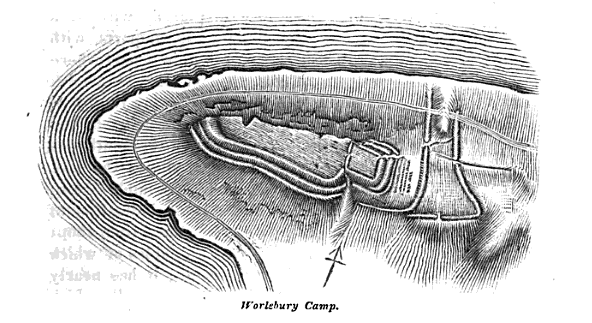 Discounting the ditches associated with walled fortifications, themes like fire, penitence and ritual could all be said to be appropriate to a pre-Christian – or for that matter Christian – sacred site, as well as an execution cemetery (and later beacon site). Quite how the ditches, however many or few there were, fit in to such use of the Hog’s Back site may never be known, but it should not prevent the search for analogous locations and practices from other cultures, wherever they might be in the world. EASTER 2013 MINI-UPDATE: The Bible verses (Luke 8:2 and Mark 16:9) which refer to the cleansing of St Mary Magdalene of seven demons or devils clearly describe an act of purification – I’ve already noted this in a blog post. Wikipedia provides a good summary of the interpretations as to the underlying meaning of the passage and it should be obvious from the text above how it fits neatly with some of the above phenomena.